The Physics And Psychology Of 'The Wave' At Sporting Events You may love or hate "the wave" as it sweeps through spectators at baseball, football and soccer games. But physicists say the synchronized action shows how humans are like particles. 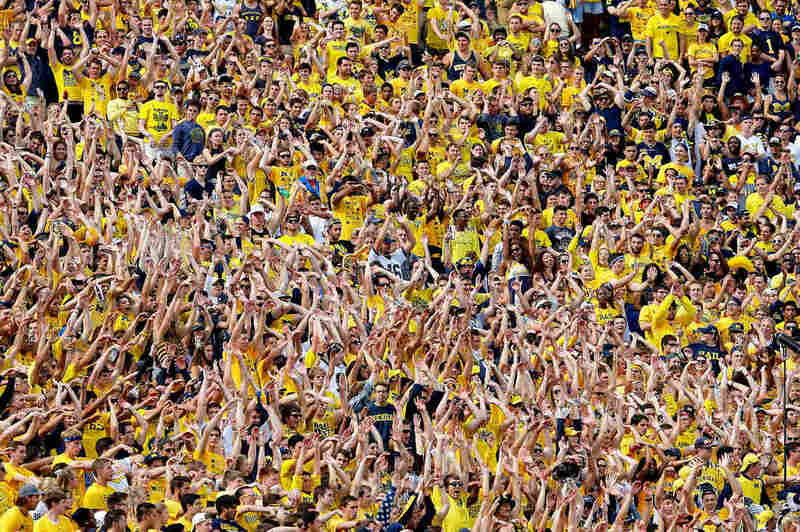 Michigan Wolverines fans do the wave in support of their team as it faces the Brigham Young Cougars at Michigan Stadium on Sept. 26, 2015, in Ann Arbor, Mich.
Illes Farkas, with the statistical and biological physics group of the Hungarian Academy of Sciences in Budapest, first began pondering the phenomenon in 2001. "It was summer," he recalls. "It was really hot," and some kind of sports competition was in town. He saw the audience do the wave and wondered: How do tens of thousands of people burst into this unplanned but highly coordinated movement? "It was basically out of curiosity," says Farkas, "an odd summer project. And then it turned in to something very serious." Physicists, after all, know that particles obeying a few simple rules can create a seemingly complex phenomenon — ice melting, for example. "And in a very similar way, surprisingly, humans do similar things," says Farkas. "The reason why we got interested in stadium waves was that people, apparently, very often behave like particles." He and two colleagues, Tamas Vicsek and Dirk Helbing, decided to determine the rules that produce "the wave." They got videos of stadium crowds from TV stations, and analyzed more than a dozen waves. They also built computer models, he says, and zeroed in on three key parameters: the distance between audience members, how many neighbors an audience member could see, and "the readiness, or probability, of an individual to start standing up, assuming that others nearby are already standing." As the team reported in 2002 in the journal Nature, each stadium wave typically rolls clockwise, moving at a speed of about 20 seats per second. To keep going, it needs to be broad, stretching from the top rows to the bottom seats. Interestingly, though, starting a wave doesn't require very many people. "It was surprising that the number of individuals necessary for triggering a wave is actually quite low," says Farkas. "It was on the order of 20, 30 or 35 people." The key, he says, seems to be to strike when the mood of the crowd is just right. A critical moment in a close game is probably not a good time to try — and will likely draw ire from your neighboring sports fans. "Waves actually happen quite often when there is nothing interesting happening," Farkas says, "or when people are very enthusiastic" — like when the home team is clearly going to win.